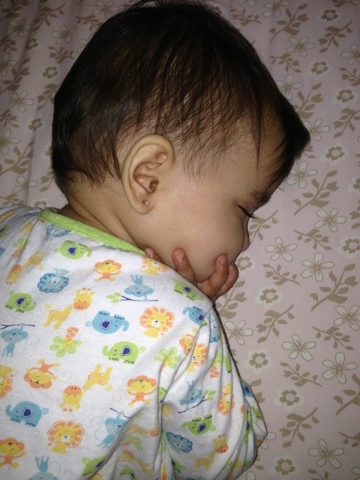 So we've been meaning to pierce Anjali's ears now for about six months. I know that lots of Canadians shudder at the thought of doing it so early, thinking that it is barbaric and painful for the child whereas lots of Easterners do it very early as the child doesn't remember and healing is very quick. I fall into the latter camp and waited for Cassia's fourth month shots and then instantly after got them done. Cassia's was done with much fanfare. We had relatives from Mississauga come down to accompany us and five adults went to the mall to get it done. Before it was done, we gave her Tylenol and tried to put some Emla cream on the ears. She still bawled her eyes out. With Anjali, I've been wanting to do it for six months now but she was four months in the winter and with the cold weather and busy schedules, it kind of fell through the cracks. However, as A and I were strolling through the mall today (literally), I saw this sign "Free ear piercing (with the purchase of earrings) done here." On a whim, or a vaps depending on where you're from, I walked in, pierced her ears and then we picked up Cassia. Done! End of story. She cried yes, but she was good in about 45 seconds. Mission accomplished and baby looks like a girl now.... especially as she still has such short locks. On a totally unrelated note, I feel like such a grown up having done this by myself. Yes, I've migrated to a different country, completed two degrees, birthed two babies and I'm starting my own business but this feels like a big accomplishment...seriously! Oh mat leave, what are you doing to me?! Now, no one will think I am a boy, even when I wear those unisex sleepers. You're such a smart mommy for piercing her ears early. She'll thank you later. We did our three girls early too under two months! This is a perfect age when mommy cares for them and they heal up great. Any moms on the fence or wanting some info, I'll be happy to send them to you..